Our web sites have moved to new address. Please use https://sites.google.com/view/aaltoaikikai/home instead. Aaltoaikikai.ayy.fi will soon redirect to this address. Welcome to the web page of Aalto Aikikai, the aikido club of Aalto University. New beginners are welcomed to the club again in the turn of January and February. There will be an introductory meeting on Tuesday, January 31st, at 5:00 pm in Jämeräntaival 5 A. There will be a short demonstration and an opportunity to try some simple techniques on the tatami. No special training gear is required. The first training for the beginners will be on Thursday, February 2nd, at 5:00 pm in Jämeräntaival 5 A. For all our trainings, see the Training Schedule of spring 2017. For more information, see Beginners. If you have any questions, please do not hesitate to contact us. 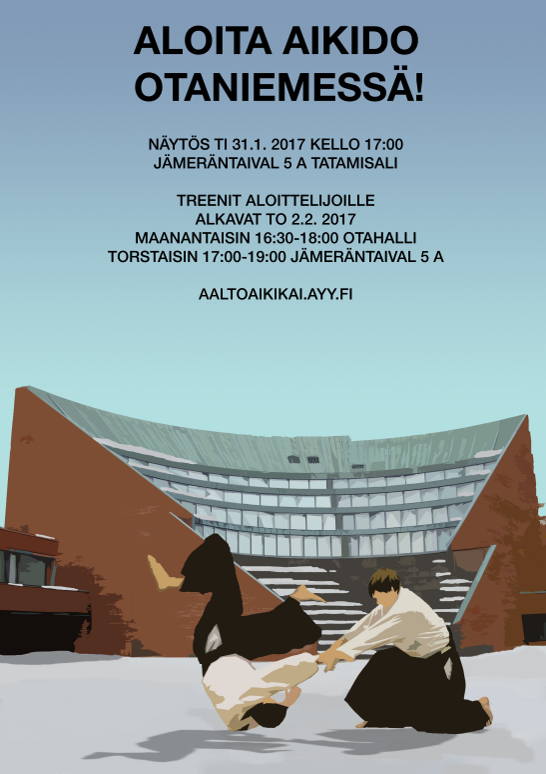 Kari Stadius (6. dan) and Pekka Laitila (3. dan) are leading Aalto Aikikai's mini seminar in Otaniemi on November 11th-12th. The seminar consists of three trainings and a sauna evening. Trainings in Aaltosali of Otahalli (Otaranta 6, Espoo). Sauna evening in rooftop sauna of Jämeräntaival 3 A. New beginners are welcomed to the club again in the end of September. There will be an introductory meeting on Tuesday, September 27th, at 5:00 pm in Jämeräntaival 5 tatami hall. This consists of a short demonstration and an opportunity to try some simple techniques on the tatami. No special training gear is required. The first trainings for the beginners will be on Thursday, September 29th, at 5:00 pm in Jämeräntaival 5. For all our trainings, see the Training Schedule of fall 2016. New beginners are welcomed to the club again in the beginning of February. There will be an introductory meeting on Tuesday, February 2nd, at 4:30 pm in Otahalli (Otaranta 6). There will be a short demonstration and an opportunity to try some simple techniques on the tatami. No special training gear is required. The first trainings for the beginners will be on Thursday, February 4th, at 5:00 pm in Jämeräntaival 5 A. For all our trainings, see the Training Schedule of Spring 2016. The training times of spring 2016 are found in Training Schedule. Info about joining the club this spring will follow very soon. Some basic info is available in For Beginners. We are once again organizing a small aikido seminar this autumn which takes place on Friday and Saturday 30-31st October. The seminar is open for everyone. Teachers from our club, Kari Stadius (6. dan) and Pekka Laitila (2. dan), deliver the trainings. The seminar takes place in Otahalli (for location, see the links on the left). We have also reserved Rovio sauna in Otaniemi for the Saturday evening. We ask for a small fee of 10 euros for participation to the whole seminar to compensate for the expenses (no separate price for single trainings). We take again new beginners to the club in September! You are most welcome to our Aikido demonstration in Otahalli on Tuesday, 22nd of September. You do not need any training gear for the demonstration; if you want, you can try some simple techniques on the tatami that do not require sports gear after the demonstration. The actual trainings for new beginners start on Thursday, 24th of September. The beginner trainings are held on Tuesday, Thursday and Friday every week. If you would like to join us later during the term or have any questions, don't hesitate to contact us! See the links on the left for the full training schedule, location information and contact information. Our spring seminar is coming up already on Friday 28th February and on Saturday 1st of March. The seminar is led by Mikko Kauppila (3. dan) and Anu Välimäki (3. dan) who are/were members of our club and are both awesome teachers. The attendance fee for the seminar is 20 euros for both days or 10 euros for a single day. On Saturday evening, we have reserved Rovio-sauna (Jämeräntaival 3 A) in Otaniemi. Trainings are held in Aaltosali of Otahalli (Otaranta 6). Everybody is warmly welcome and encouraged to attend. The training schedule of Spring 2015 is here. We will have a demonstration and an introducory meeting for new beginners on Monday, February 2nd, at 4:30 pm in Otahalli (Otakaari 6). The first trainings for the new beginners are on Thursday, February 5th, at 5:30 pm in Jämeräntaival 5 A.
Aalto Aikikai organizes an aikido seminar between 15th and 16th of November in the sports hall Otahalli in Otaniemi (Otaranta 6). The seminar is led by Jukka Luoma (6. dan) and Jarmo Halttunen (5. dan). The seminar suits well also those who have started aikido just this autumn. at 17--> get-together at Rovio sauna (Jämeräntaival 3 A). Each one will buy their own food and beverages. There is a kitchen at the sauna. There is a grocery store in Otaniemi.